Happy Tuesday everyone! Last weekend, I got back from the most amazing trip around Europe. I got to see some brand new places, and even visit some old ones. I had way too much gelato, pasta, bread, and cheese, but it was worth every single delicious bite! I mean, whats a trip to Italy without having gelato almost every day?? Over these next couple weeks, I will be sharing a guide for each city I visited. Now get out there and start planning your next adventure! We started off bright and early in Rome, Italy after a 9 hour flight. It was super hard to sleep on the plane, but I managed to get a few hours in. Once we landed, we headed to Stow Your Bags. This is a luggage storage place located near the Colosseum. We couldn't check in until the afternoon, so the ability to check our bags in and waist no time in Rome was amazing. I would highly recommend them if you are in the same dilemma as us! They even provide a taxi service, which we took from the airport to their place and you get a free stored bag when you do that. 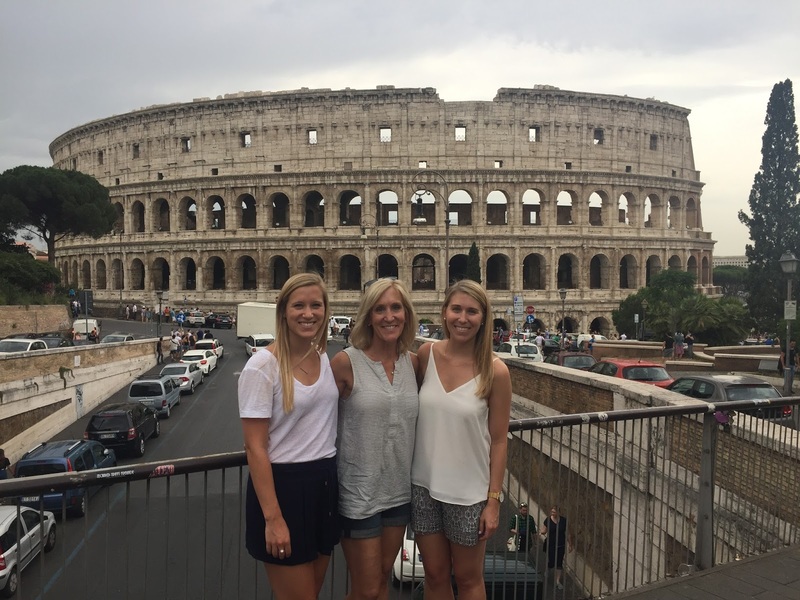 Once our bags were checked, we headed to see the Colosseum. What a huge, beautiful piece of Roman history! It was swarming with tourists and the lines were very long. Luckily, I pre-booked us tickets so we didn't have to wait in a very long line. We spent about an hour walking around, but it was so hot and crowded that it wasn't very enjoyable. Everyone with their audio guides (we purchased some here and they lasted about 15 minutes) kept stopping and clogging up the walk way. There were way too many people and it was way too hot! After the Colosseum, we walked by Castel St. Angelo and then headed to the Spanish Steps. Unfortunately, the Spanish Steps were being worked on so we couldn't even see more than the first couple steps. Pretty disappointing! We headed for lunch after and stumbled upon a place called Brassai. It was really cute and the service was wonderful. We got pizza and a salad and split it between the three of us. We also got some great white wine that was recommended by our server. If you are in the area, this is a quick and good place to stop. After lunch, we went to our apartment to freshen up and unpack. For dinner, we decided to go eat in the Trastevere area (where we were staying and I would definitely recommend staying here). This area is absolutely adorable and one of my favorite parts of our trip. The streets are all cobblestone and very narrow (it's hard to imagine a car driving down these roads, but they do...Italians are crazy!). It also has an American University close by, so it is filled with young Americans and a lot of English speaking people. We wandered around and decided on a place called Grazia & Graziella. They had a huge outdoor space and were packed. We luckily got the last open table! It was such a fun and lively place. We ended up ordering some Rosé, calamari, and a prosciutto, greens, and cheese plate. Everything was amazing and I highly recommended! After dinner, we walked to the Trevi Fountain. It was a 40 minute walk and I felt like we would never make it there, but once we did, it was breathtaking. We got their around 10 PM and it was still so crowded! Anna and I threw in some coins, made a wish, and then headed home for some much needed sleep. On our second day, we headed to the Borghese Gallery. It was a beautiful building and if you're into art, I would recommend it. They had a café at the end and Anna and I got some iced cappuccinos. They even put whipped cream and coco powder on top! They were delicious and 100% needed after our flight yesterday. After the museum, we headed towards Vatican City. We stopped at a sandwich place on the way called Duecento Gradi. If you are in the area and need a quick lunch, this is a place worth checking out. They have so many sandwich options that you just can't go wrong with any of them. Then, we headed to Vatican City. We didn't have to wait long to get into the Vatican, because I had pre-booked us tickets. We wandered around the museum, the Sistine Chapel, climbed to the top of St. Peter's, and walked around St. Peter's square. It was a really cool place to see! 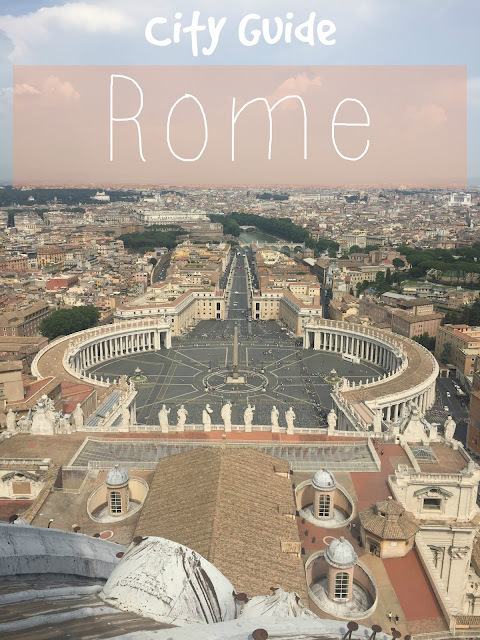 I would definitely recommend climbing to the top of St. Peter's, because you get some great views of the Basilica and the city. Then, we headed home to freshen up for dinner. We went back to Trastevere, to a wine and cheese spot we passed the night before. It was called La Prosciutteria and if you get the chance, you definitely need to go there. I mean, just look at that cheeseboard! It was the most beautiful thing I had ever seen! It was filled with eggplant, prosciutto, salami, roast beef, bread, spreads, tomatoes, olives, and different types of cheese. They also had a house white wine for 9 euros a bottle and it was very good! The place doesn't have too much seating, but we grabbed the one little table they had outside. It was a great place for people watching! After dinner, we headed out for some Italian gelato. We went to Frigidarium and it was hands down the most amazing gelato from the whole trip (unfortunately I didn't get a picture). I even got mine dipped in chocolate! The line was wrapped around outside the store, but it was completely worth it! Overall, Rome was a beautiful city with the nicest people! Would I go back again? Probably not, but it is definitely a good place to experience once in your life and 2 days was just enough.